I really enjoy dipping a toe into YA fiction once in a while. It’s a nice change of pace and there are some great storytellers out there writing books for young people. Though I’m obviously not in the target demographic, I was happy to get a chance to read first time author Angelina Allsop’s Peter Green and the Unliving Academy. The book opens with young Peter (he is 14 years old) awaking to the realization that not only is he sleeping in the middle of a busy station, he’s also dead. He doesn’t know how he knows he’s dead, but it’s the only thing about which he is completely certain. As he rouses himself (dressed curiously in striped pajamas and a necktie) he is met with people rushing everywhere and only a bare minimum of assistance. He finally makes his way to Battisworth’s Academy and Haven for Unliving Boys and Girls, and that’s where our adventure begins. You see, though Peter remembers nothing of his life or death, he has a nagging feeling that there is a danger he needs to address. To do that, he needs to get his memories from the powers that be in this strange new world. So, first the good things. Peter Green and the Unliving Academy is clearly the first book in a series and Allsop spends quite a bit of time world building. There are a lot of interesting things going on in Peter’s afterlife, including supernatural creatures, mundane jobs, an under-underworld, and even some pretty girls. Being an unaccompanied child carries with it some special circumstances, which the Academy is there to help manage. Peter meets some good friends and a lot of very odd acquaintances. World building is always fun and though this first installment lacks a bit in originality (there are definitely quite a few heavy Harry Potter influences, along with some other very familiar paranormal elements) Allsop manages to set us up really nicely for the next book. She seems to be willing to step out of those early influential boxes and make this world a fun combination of magic with a side of mafia. She has set up a nice springboard to make this fantasy world all her own. Some of the characters stand out as particularly likable as well. While Peter himself is prone to jealousy, a verve for violence, and some seemingly thoughtless unkindness, I have to repeat that I am not the target audience for this character. He may well appeal to kids and teenagers who relate to his desire to be athletic and stealthy and somewhat sinister. But I adore his sidekick, Scoot (real name, Samantha) who is already athletic and stealthy. She’s also confident, competent, and fun. I also liked Peter’s friend Charlie pretty well, though Allsop really could have separated his eccentricities from his sexuality. He comes off as a flamboyant gay stereotype, albeit a genuinely caring and kind one. Now, the not so great. As a first time author, Allsop needed some really good editing and it’s pretty clear she didn’t have it. 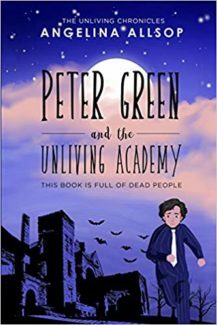 There are typos and grammatical errors throughout Peter Green and the Unliving Academy, as well as clunky sections of prose and dialogue that a good editor would have helped her smooth out on the first pass through the book. Some of this is on Allsop, because it is her book, but no one can adequately edit themselves. More of it is on the publisher for not providing good editorial assistance in the first place. Just because it is YA fiction does not give them a pass on proper spelling, grammar, and structure. Kids and teenagers are sophisticated audiences, just because they text and tweet doesn’t mean they don’t want a well put together book. Given the abundance of very well written and edited YA books on the market, there isn’t a place for books that seem rushed or given less than someone’s full attention. I feel like Allsop’s publishers let her down, and I wish she had been given the opportunity to work with someone with a greater interest in seeing her ideas presented in their best light. As it currently stands, I can’t recommend Peter Green and the Unliving Academy, despite the promise of an interesting world for a series. The book simply has too many errors and too many choppy, clunky sections to turn the ideas into an enjoyable read. And that’s too bad. I hope Allsop continues her story with better editorial assistance; I would like to see where she takes Peter and his friends.